The continuing revolution in computing is having a dramatic influence on Statistics. New methods that apply previously unthinkable amounts of computation to small sets of data to produce confidence intervals and tests of significance in settings that do not meet the conditions (small sample or skewed distributions or complicated statistics such as ratio) for safe application of the usual methods of inference. The methods which we use to compare two groups mean or proportion, testing associations etc rest on the use of normal distributions. However, many times data are not exactly normal. In such situations, we cannot use t confidence intervals and tests if the data are strongly skewed, unless our samples are quite large. Similarly inference about spread based on normal distributions is not robust and is therefore of little use in practice. In many occasions, we are interested in, say, a ratio of means and ratio of proportions, rates etc, such as the ratio of BP in new treatment group vs control (reference group) or the ratio of two incidences (ratio of intervention group vs control group). Especially the traditional statistical methods are not stable or unreliable, when the observations are small. There is no simple traditional inference method for dealing with small numbers. Though we have non parametric tests, these tests will provide p values but not the 95%CI for the effect size of the ratio of two means. The bootstrap (resampling) confidence intervals and permutation tests—if applied, provides power to relax some of the conditions needed or avoid distribution assumptions for traditional inference. The fundamental reasoning is still based on asking, “What would happen if we applied this method many times?” Answers to this question are still given by confidence levels and P-values based on the sampling distributions of statistics. The New methods set us free from the need for normal data or large samples. They also set us free from formulas. They work the same way (without formulas) for many different statistics in many different settings. They can, with sufficient computing power, give results that are more accurate than those from traditional methods. Besides above this course trains researchers in simulating Regression Methods as well. Clinical Trials: Permutation Tests are recommended for Phase II trials and they are invariably based on small number and may have skewed distributions. Permutation test based on simulations would provide a better estimate than the traditional methods. 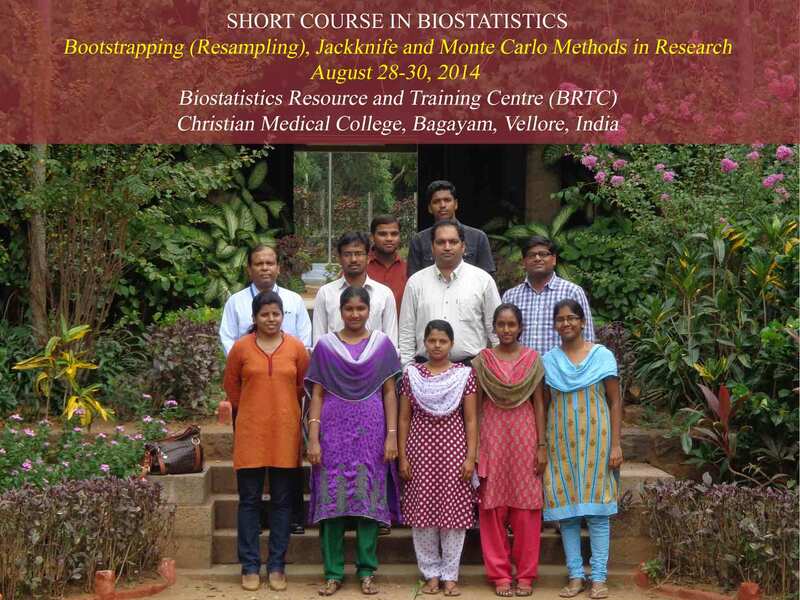 Statisticians/Biostatisticians, Epidemiologists /MPH with research background and Researchers and Faculty who have attended Short courses on Fundamentals of Biostatistics, Epi and SPSS and Regression, Logistic Regression and Survival analyses. R software will be used. 2 Hours orientation will be provided for the new participants who have not used R. Each topic will be based on Lectures followed by Practical (1.5 hours each). Well prepared course materials and practical exercises are available. Basic bootstrap methods for the evaluation of SE of an estimator. Applications in biology and Genetics.